Common features of a livable community include a place that is safe, has usable outdoor spaces, and provides opportunities for work and play, as well as all of the necessary services and effective ways to get around, regardless of age or life stage. Leaders across the nation, and Connecticut, are hard at work to make their city, town or neighborhood a great place for people to call home or visit. There are multiple areas of livability that are important, including: housing; transit, streets and sidewalks; public places and outdoor spaces; health and wellness; community engagement; work, volunteerism and opportunity; and arts, entertainment and fun. For the third consecutive year, AARP is celebrating the creative work from communities as part of our Where We Live: Communities for All Ages series of publications, available for free. Our award-winning Where We Live series highlights the inspiring ideas and solutions from America’s local leaders to improve their communities, respond to pressing issues and build partnerships. Over the past three years, we’ve shared hundreds of ideas and examples from community leaders through the Where We Live series. AARP is proud to put a spotlight on what this livability revolution looks like on the ground, from city and countywide initiatives to small changes that make a big impact. The 2018 edition of Where We Live: Communities for All Ages features more than 200 articles and photographs on the ways communities throughout the United States are becoming great places to live for people of all ages. It features inspiring programs, people and places from all 50 states, the District of Columbia, the U.S. Virgin Islands and Puerto Rico. The spotlight shines on three Connecticut efforts in the book: Knox in Hartford, the LiveWell organization in Plantsville and the Shoreline Trolley Museum in East Haven. 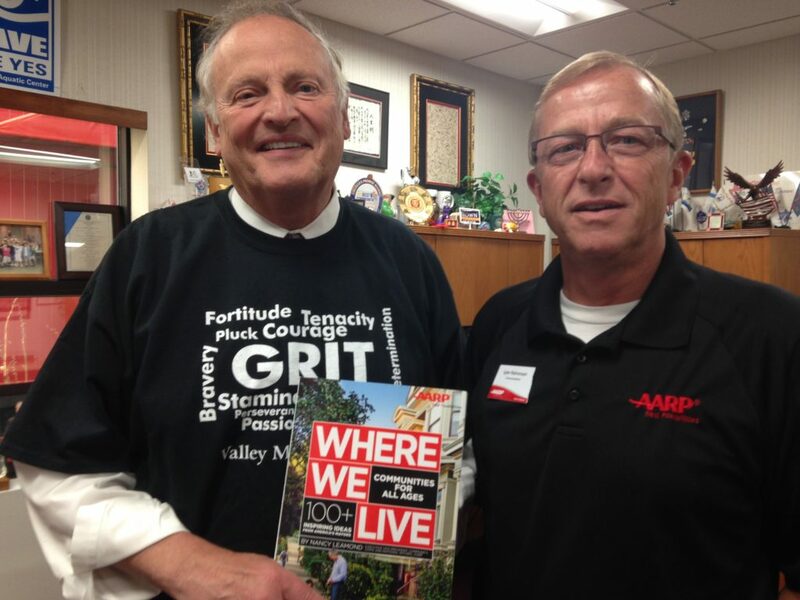 Torrington’s innovative Artist Relocation Program was featured in the 2017 Where We Live – Community for all Ages book, which is still available for free at www.aarp.org/WhereWeLive. We’re proud that the hard work of three of the many, many community leaders in our state is being recognized. These efforts are crucial to ensuring the vitality and long-term viability of our communities around the state, which in turn makes Connecticut stronger. Our third edition celebrates what AARP is calling the “Experienced Class” – people who enhance communities through their skills and life lessons, influence and involvement. Each chapter shines a spotlight on the positive contributions that older adults make in communities, highlighting the actions community leaders can take in their own communities. We hope that with this book, and our related Livable Communities website (AARP.org/livable) and award-winning AARP Livable Communities e-Newsletter (AARP.org/livable-subscribe), we can provide a platform to inspire even more creativity and sharing of best practices to spur innovation in making all communities great places for people of all ages. For more information, or to download or request a free copy of Where We Live, visit AARP.org/WhereWeLive. You can also join the conversation on Facebook at Facebook.com/AARPLivable and on Twitter @AARPLivable. Tell us about where you live. Provide a brief description of the project, feature, place or service that helps make your community livable for people of all ages. Complete our Sharing Livable Solutions form (https://www.aarp.org/livable-communities/sharing-ideas-solutions).